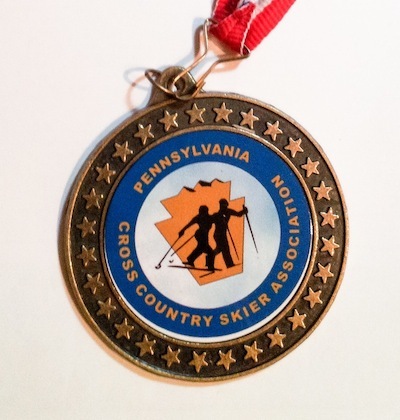 The PA nordic championship races are canceled for 2018. We hope for more favorable conditions next year. Click here for online registration - it will close at 5pm on Saturday Feb 24. Registration will also be available on the day, cash or check only. If you plan to register on race day, you can speed up the process by downloading and filling out the registration form at home. Please note that there will be an extra charge of $10 for race-day registrations for the adult and youth races. Registration and bib pick-up will be in the basement of the trail pass building, to the left of the main lodge. Access to registration is at the rear via the wooden staircase beside the building. The race fee includes a trail pass for the day and the adult race fee includes a tech t-shirt, while supplies last. Adults: One race $40, two races $55. Extra $10 for on-the-day registration. Includes long-sleeved tech t-shirt (while supplies last) & trail pass. Awards for the first 3 men and women, and for the first place in each age group. Youth: One race $25, two races $30. Extra $10 for on-the-day registration. Includes trail pass. Awards for the first 3 boys and girls in each age group. Children: $5. Includes trail pass. Freestyle race: awards for the first 3 boys and girls in each age group. Classic race: ribbon for all participants. The awards ceremony will take place soon after the end of the skate races (approximately 1:00 PM). Door prizes from our sponsors will also be given away at the awards ceremony. All race participants will be eligible for the door prize drawings. Awards for the classic and childrens races will be available after these respective races finish. Adults: The 5k classic and 20k skate are 18+ but the 10k skate is 16+. Youth: The 5k youth races are for U16 and U18 - birthdates from 1/1/00 to 12/31/03. Children: The 2.4k freestyle race is for U12 and U14 - birthdates from 1/1/04 to 12/31/07 and the 1.2k fun classic race is for U12 and younger - birthdates of 1/1/06 and later. One long sleeved tech t-shirt will be provided to adult race entrants, while supplies remain. The youth and childrens race entry fees are considerably less and do not include t-shirts. Extra shirts may be purchased at registration for $15 each, from 10:30 on, while supplies remain. The sizes available are adult S to XL. Some of the roads near the lodge are not plowed in winter. There are directions here http://www.thewildernesslodge.net/contact-directions/ with a useful map of the flattest way to get there from the main road. The hotel this year is again the Wingate by Wyndham. It's right off of I-90 at Exit 24 (Peach Street). The address is 8060 Old Oliver Rd., Erie, PA 16509. The hotel is only a few years old, has an indoor pool and hot tub, and free breakfast, and it is nearly FULL. Ask for the PA Cross Country Ski rate of $94/night and be aware that by 2pm Feb 2 these were all taken, but maybe someone might cancel. There may also be rooms available at Wilderness Lodge - book ahead as it fills up fast.